We learned a lot about the life of a kid in Myanmar today. Directly opposite our hotel was what seemed to be a school, and we could hear the kids chanting through the evening into the night. At around 8pm they streamed into the street on their way home. It seemed very strange to us that kids were studying so late but we only found out why the following day. Daniel and I woke up at the crack of dawn on our last day in Hsipaw. 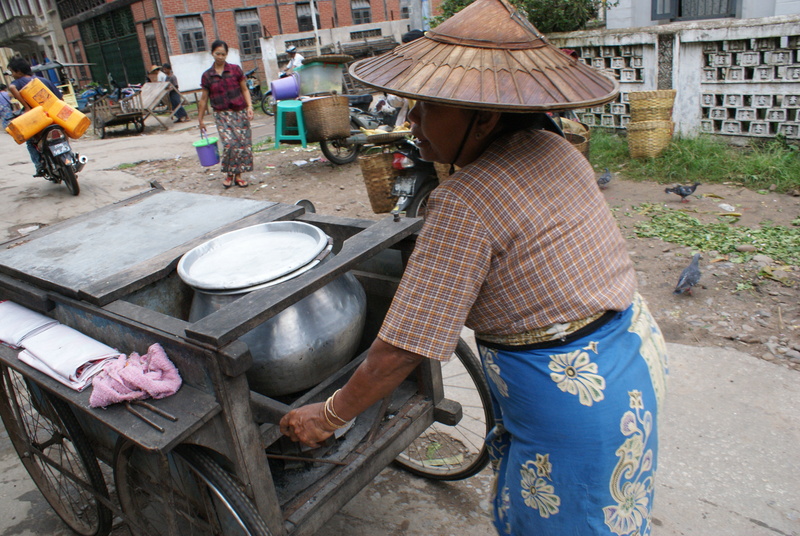 The reason – so that we could visit the morning market, which starts at about 4am and finishes by around 6.30am. 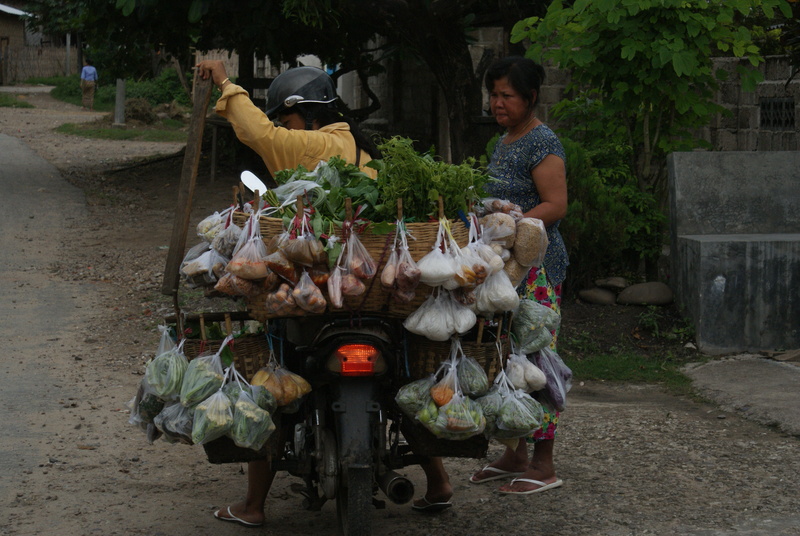 The market is definitely not for tourists – rather, it’s part of every day life in Hsipaw, where people come to buy their daily food. We wandered in and out of hundreds of little stalls and vendors sitting on the ground – fish, live chickens, all kinds of fresh produce…and of course the people, in various regional dress. Many markets around the world are big tourist draws, but not this one, which was as authentic as they come. As we wandered about, we met the goldsmith whose store we had visited the previous day. He was thrilled to see us again and offered Daniel a short ride on his motorbike back to his shop. I ran behind them. Back at the store, he invited us to come visit his kids’ school later on that morning. On special occasions a parent has the honor of making a donation (in the form of rice) to the school. Foreigners are not allowed to visit public schools in Myanmar, but he assured us that he would ask special permission from the principal for us to come see the donation ceremony. First, he offered to take us to see his kids at their private morning class. We didn’t quite understand until he explained to us. 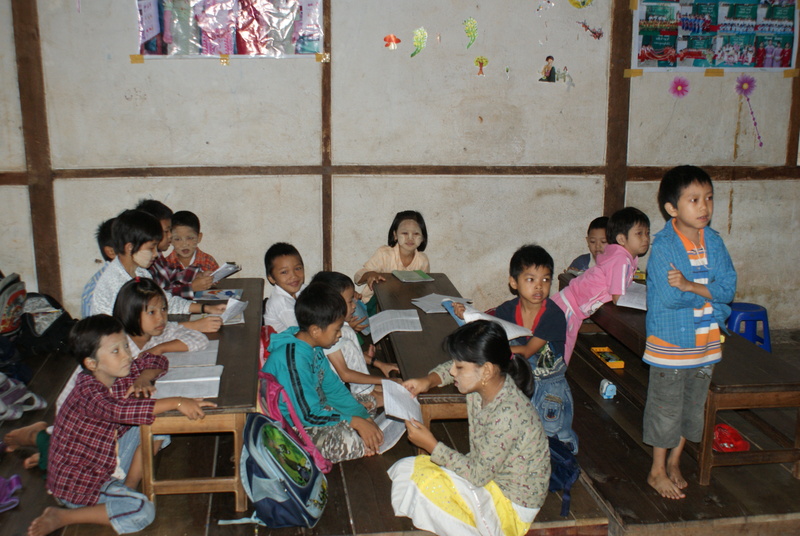 Public schooling in Myanmar typically runs from about 9am until 3pm every day. Attendance is mandatory and the kids all wear the green uniform that we had seen during our travels. However, he explained that generally, the quality of the education is very poor due to the numbers of kids in a class, the teaching materials etc. So, parents who can afford it, hire the same schoolteachers to run a private class before and after school. The goldsmith’s kids attended school from 5am until 7.3o am, after which they went home for breakfast and then to public school. 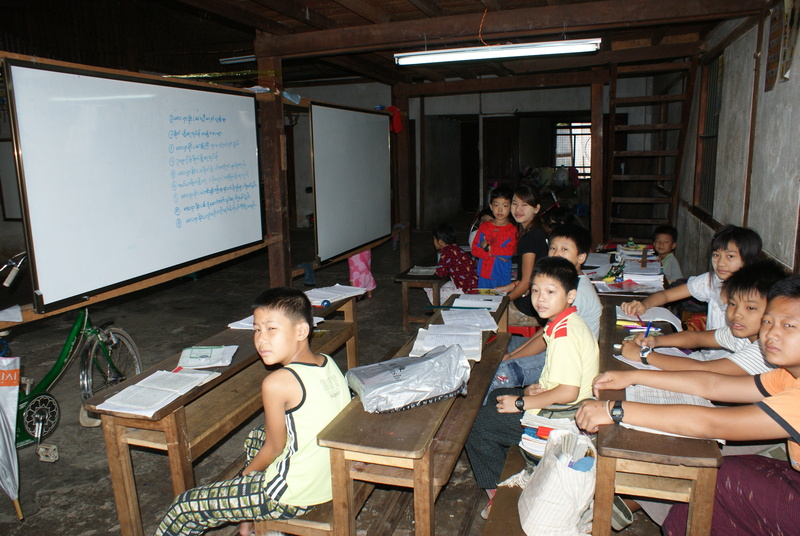 In the evening, they went back to private school from 5pm until 8pm. There is no way my kids would manage a school day like that. The goldsmith has high hopes for his kids. He explained that about 1 out of 10 applicants make it into university in Myanmar, and that private schools in cities such as Mandalay and Yangon are flourishing. He was hoping to be able to send his children to private school in Yangon for their high schooling, and that ultimately they would go to university in Singapore. There is no doubt that he represented a very aspiring middle class. There are probably many other parents just like him. Taking a spin around town. I’ve always heard about the Asian committment to education. This was a real eye opener for me. So, later that morning, we met him at the school and visited the kids. We were not allowed to photograph the facilities and the school did indeed look very impoverished. But, as we already knew, this did not mean that at least some of the kids were on their way to receiving an excellent education. Later, we left Hsipaw and had a long but uneventful ride back to Mandalay. « Myanmar/Burma with Kids: Trekking in Hsipaw.